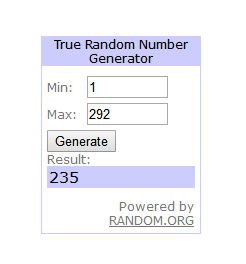 Congratulation to @tbt127 #235, please PM me u shipping address. Hey guys, as much as I really wanted to win this RDA, post #235 isn’t mine, it’s @VladSumy’s, which is one above mine! Talk about bad luck for me! So, Congratulations to you @VladSumy!!! Edit: Nevermind…just remembered that I could find out for sure by searching tbt127 and VladSumy in the search box and click “search this topic” and it gives the numbers of the posts that has us in them, and yep, #235 is definitely @VladSumy’s prize! Congratulations to @tbt127 @VladSumy #235 #236, please PM me u shipping address. Oh my gosh! I just noticed this! You guys ARE sooooo Great!!! Thanks soooo much! Congrats to you @VladSumy, and thank you @HealthCabin! You guys are amazing! Congrats @SunnyT and @VladSumy !!! But I never went back to look after the initial winner announcement that I saw! It was nice of you and from @HealthCabin as well! What a store ha?! !